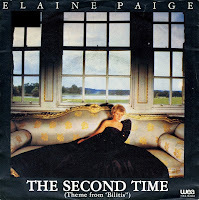 A fully orchestrated song, a beautiful ballad, that's what Elaine Page's 'The second time' is. On the sleeve of the single, it is also described as the 'theme from Bilitis'. 'Bilitis' was a French movie from 1977, which portrays the sexual adventures of a young girl during summer vacation. The theme of the movie was instrumental, Elaine Page's version adds a lyric written by Tim Rice. The result is a beautiful, dreamy song.